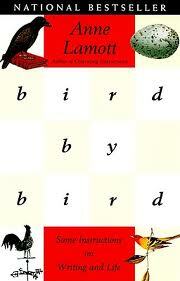 Just about every author I’ve asked about what books should I read on writing, always says Anne Lamott’s Bird by Bird and Stephen King‘s On Writing. I’ve read them both in the past, but now I’m seeing them through new eyes. There was a time when I said I wanted to be a writer, but life always got in the way. I would finish a few pages and think this is great. A few days later I would read those pages again and realize how awful they were. I didn’t see the gems hidden within that first draft. I have found my first draft is just my way of getting the ideas down on paper. It is with the editing and rewriting that the real story begins to appear. I was under the misconception that when a writer writes, everything is wonderful. I had no idea how many drafts a piece can go through. I just turned in my first short story for the MFA at Converse College. I am anxiously waiting to hear what my mentor has to say. The story was birthed at Hub City’s Writing in Place conference through a prompt given to the glass by Wiley Cash. His novel, A Land More Kind Than Home is one of my new favorite books. I can’t wait to read his next novel, This Dark Road to Mercy. He read just a few pages to us this summer. I know when I finally get my copy, my nose will be buried in a book. My family will need to understand that I will be unavailable once I start. (Of course they are used to this. Me, immersed in a novel? Yes since the days of Nancy Drew, Trixie Belden, and Laura Ingalls). That day in class I wrote two pages. Wiley encouraged me to keep with it and see where it went. The story I finished with was not the one I started with, but I did keep a few of the sentences in tact. From that scene came a short story about a little girl who is caught between the innocence of childhood and the excitement of becoming a teenager. She has a kitten poster beside a Shaun Cassidy poster hanging on her bedroom wall. She loves her mother and yet she is embarrassed by her as well. So many books and so little time. I’ve replaced my radio listening time with audio books. 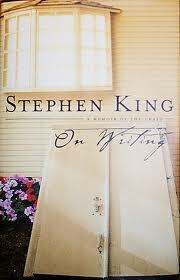 Right now I’m listening to Stephen King narrate On Writing. I believe it is so powerful to hear the author read especially about his own creative process. I am still in awe of King’s overwhelming elation at selling the paperback rights to Carrie. It was more money than he ever imagined. All this from a little story he started and originally threw in the trash. His wife, Tabitha saved it and encouraged him to keep going. A supportive spouse is a definitely plus for anyone who aspires to be an author. My husband sometimes teases me when I start talking about people. Are these real people or characters in your work?